Underwater environmental conditions have a major influence on the selection of divers, diving technique, and the equipment to be used. In addition to environmental hazards, a diver may be exposed to operational hazards that are not unique to the diving environment. This section outlines the environmental and operational hazards that may impact an operation. 6-6.1 Underwater Visibility. Underwater visibility varies with depth and turbidity. Hori zontal visibility is usually quite good in tropical waters; a diver may be able to see more than 100 feet at a depth of 180 fsw. Horizontal visibility is almost always less than vertical visibility. Visibility is poorest in harbor areas because of river silt, sewage, and industrial wastes flowing into the harbor. Agitation of the bottom caused by strong currents and the passage of large ships can also affect visibility. The degree of underwater visibility influences selection of dive technique and can greatly increase the time required for a diver to complete a given task. For example, a diving team preparing for harbor operations should plan for extremely limited visibility, possibly resulting in an increase in bottom time, a longer period on station for the diving unit, and a need for additional divers on the team. 6-6.2 Temperature. Figure 6-11 illustrates how water temperature can affect a diver's performance, and is intended as a planning guide. A diver's physical condition, amount of body fat, and thermal protection equipment determine how long exposure to extreme temperatures can be endured safely. In cold water, ability to concentrate and work efficiently will decrease rapidly. Even in water of moderate temperature (60-70°F, 15.5-21.5°C), the loss of body to the water can quickly bring on diver exhaustion. Figure 6-11. 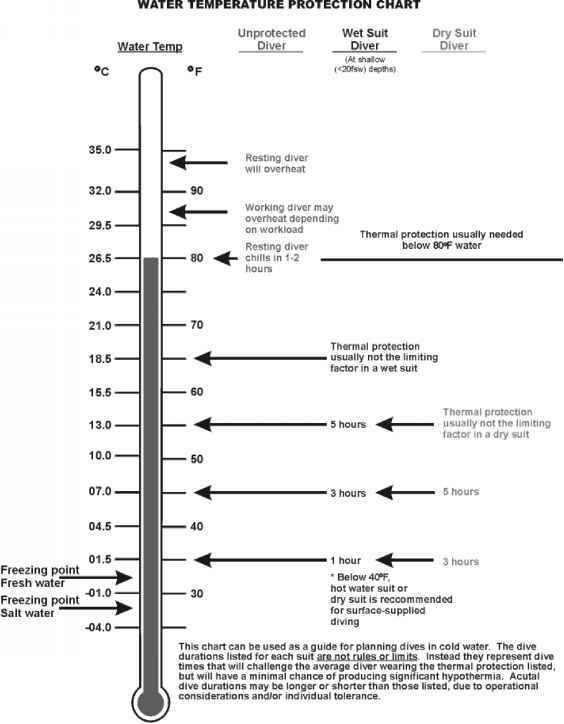 Water Temperature Protection Chart. manual may be required to deal with nuclear, biological, or chemical contaminants. Resources and technical advice for dealing with contaminated-water diving conditions are available from the National Oceanic and Atmospheric Administration (NOAA) HAZMAT Department. 6-6.4 Thermal Pollution. Divers may encounter a variety of forms of pollution that can cause problems. Divers may be required to work in the vicinity of a sewer or industrial outfall discharging high-temperature wastes. In such situations, the diver and topside personnel shall be particularly alert for the symptoms of heat exhaustion. To date, no practical dress has been designed specifically to protect the diver against unusually warm water although hot water suits may be used with cold water piped to the diver. A diver working near sewer outlets or industrial discharges may also be exposed to biological or chemical pollution hazards. 6-6.5 Chemical Contamination. Oil leaking from underwater wellheads or damaged tanks can foul equipment and seriously impede a diver's movements. Toxic materials or volatile fuels leaking from barges or tanks can irritate the skin and corrode equipment. Diving units should not conduct the dive until the contaminant has been identified, the safety factors evaluated, and a process for decontamination set up. Divers operating in waters where a chemical or chemical warfare threat is known or suspected shall evaluate the threat and protect themselves as appropriate. The MK 21 UBA with a double exhaust and a dry suit dress assembly affords limited protection for diving in polluted and contaminated water. Refer to the MK 21 UBA NAVSEA Technical Manual, S6560-AG-OMP-010-UBA-MK21/1 for more information on using the MK 21 UBA with a dry suit assembly. 6-6.6 Biological Contamination. Scuba divers are especially vulnerable to ear and skin infections when diving in waters that contain biological contamination. Divers may also inadvertently take polluting materials into the mouth, posing both physiological and psychological problems. In planning for operations in waters known to be polluted, protective clothing and appropriate preventative medical procedures shall be taken. Diving equipment shall be selected that gives the diver maximum protection consistent with the threat. External ear prophylaxis should be provided to diving personnel to prevent ear infections. 6-6.7 Altitude Diving. Divers may be required to dive in bodies of water at higher alti tudes. Planning shall address the effects of the atmospheric pressures that may be much lower than those at sea level. U.S. Navy Air Decompression Tables are authorized for use at altitudes up to 300 feet above sea level without corrections (see paragraph 9-12). Transporting divers out of the diving area, which may include movement into even higher elevations either overland or by plane, requires special consideration and planning. The Diving Supervisor shall be alert for symptoms of hypoxia and decompression sickness after the dive due to the lower oxygen partial pressure and atmospheric pressure. 6-6.8 Underwater Obstacles. Various underwater obstacles, such as wrecks or discarded munitions, offer serious hazards to diving. Wrecks and dumping grounds are often noted on charts, but the actual presence of obstacles might not be discovered until an operation begins. This is a good reason for scheduling a preliminary inspection dive before a final work schedule and detailed dive plan is prepared. ■ GFIs are required when line voltage is above 7.5 VAC or 30 VDC. ■ GFIs shall be capable of tripping within 20 milliseconds (ms) after detecting a maximum leakage current of 30 milliamps (ma). ■ GFIs require an established reference ground in order to function properly. Cascading GFIs could result in loss of reference ground; therefore, GFIs or equipment containing built-in GFIs should not be plugged into an existing GFI circuit. 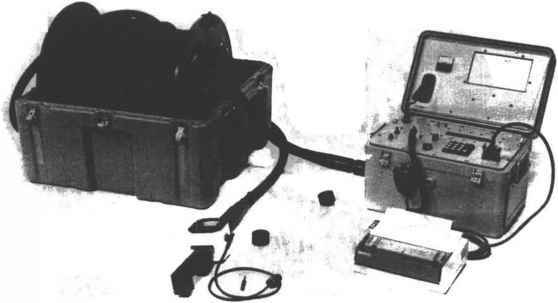 The electrical equipment which the diver is operating must experience a ground fault. The diver must place himself in the path between the fault and earth ground. Electrical equipment is properly maintained. All electrical devices and umbilicals are inspected carefully before all operations. Electrical umbilicals are adequately protected to reduce the risk of being abraded or cut when pulled over rough or sharp objects. Personnel are offered additional protection through the use of rubber suits (wet, dry, or hot-water) and rubber gloves. GFI circuits are tested at regular intervals throughout the operation using built-in test circuits. Divers operating with remotely operated vehicles (ROVs) should take similar precautions to ensure the ROV electrical system offers the required protection. Many new ROVs use extremely high voltages which make these protective actions even more critical to diver safety. Units should be sent to the above address with a DD-1149 and complete return address and written details of problem. Ship impressed-current cathodic protection (ICCP) systems must be secured, tagged out, and confirmed secured before divers may work on an ICCP device such as an anode, dielectric shield, or reference cell. When divers are required to work close to an active ICCP anode and there is a risk of contact with the anode, the system must also be secured. In situations other than those described above, the ICCP is to remain active. Divers working within 15 feet of active systems must wear a full dry suit, unisuit, or wet suit with hood and gloves. All other underwater electrical equipment shall be secured while divers are working over the side. 6-6.10 Explosions. Explosions may be set off in demolition tasks intentionally, accidentally, or as the result of enemy action. When working with or near explosives, the procedures outlined in SWO 60-AA-MMA-010 shall be followed. Divers should stay clear of old or damaged munitions. Divers should get out of the water when an explosion is imminent.